How the hell does this thing managed to get a better lap time than the Skyline R34, albeit the non GT-R version, the Merc E500, and the 300ZX Turbo at Tsukuba? Amazing! 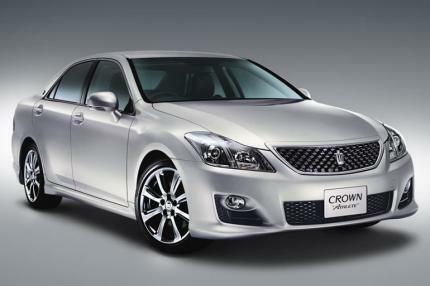 Toyota Crown is JDM (Japanese Domestic Market) car. It isn't available in Europe and in the USA. Besides the FJ Cruiser, it seems to be the only decent Toyota on the market today. Toyotas europen model lineup is so boring that they recived a giant care sales minus of over -24%for Toyota and over 28% for their Lexus brand..
Well, if you ask me this car is more interesting than entire Toyota's lineup for Europe. Most American mainstream cars of today are not esthetically pleasing. They are big, tasteless, dull sometimes just plain ugly. However, there are plenty of modern American cars that are iconic and excellent in terms of visual appeal (mostly, but not always, the expensive ones) - Corvette, Chrysler 300C, Hummer, Viper, Ford GT and others.